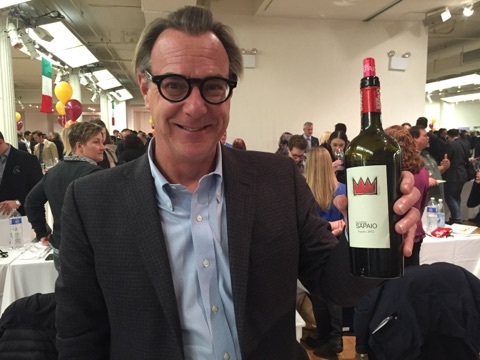 On Tuesday, Gambero Rosso and hundreds of wineries displayed their latest achievements at the 2016 Tre Bicchieri tasting at the Metropolitan Pavilion in Manhattan. This was my fourth consecutive year covering this event and the wines continue to meet and often exceed expectations. 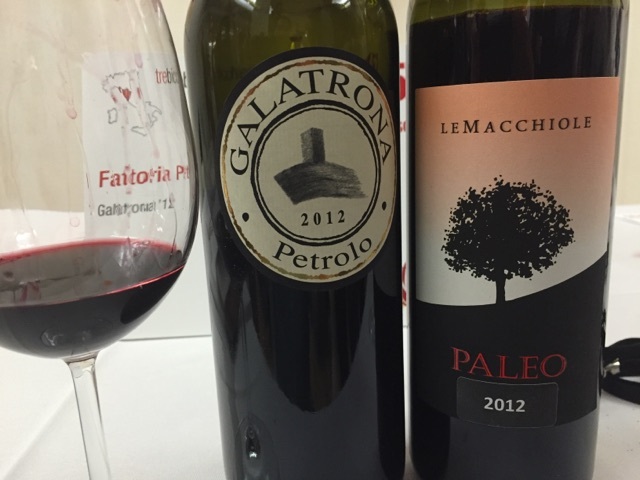 Recent vintages have been excellent, but that aside, the quality of Italian wines in general has never been higher. As a member of the press, I was able enter the tasting 60 minutes prior to the general public, so I did my best to taste and take advantage of the peace before the crowds assembled. Like last year, I attempted to focus on wines that I felt would be of greatest interest to the majority of readers and also to linger a little longer with each of the wines and winery representatives. Many of the wines included below were tasted twice. With events of this nature, the wines were tasted without food and the pours were often very small. As such, my impressions are somewhat limited and only a range of scores is provided. 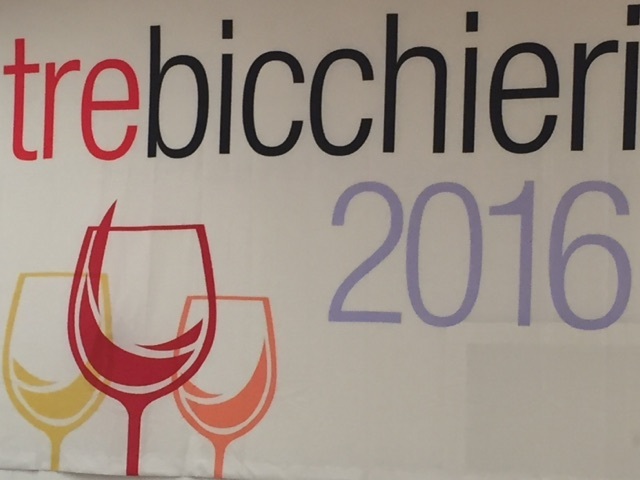 Unless otherwise noted, all wines below received the Tre Bicchieri award. I decided to begin with the 2014 Gambero Rosso winery of the year. The representative from Domaine Select is very charming and I enjoy chatting with her. Plus, I wanted to take advantage of tasting Poggio di Sotto quietly before the crowd assembled. 100% Sangiovese aged in large casks that is a dead ringer for classic Brunello. This is a perennial Tre Bicchieri winner and deservedly so. Classy and elegant with aromas and flavors of crushed cherry, tobacco leaf and spices. 91-93 points. A blend of 65% Cabernet, 25% Merlot and 10% Sangiovese, Grattamacco is also a perennial Tre Bicchieri winner. French barrique aged for 18-21 months in a combination of new, first, and second passage barrels. This is behaving very much like a Cabernet right now. Deep purple color. Loads of black plum, cedar and spice on the nose and palate with loads of tannins that are very well integrated. Definitely one for the cellar. 92-95 points. Purchased by Colle Massari in 2011, Poggio di Sotto is a 44 hectare estate that produces Brunello and Rosso di Montalcino. All of Poggio di Sotto’s vines lie within the Brunello zone and are “farmed” to be Brunello, but then a selection is made for the Rosso and only the best grapes find their way into the Brunello. Kept in barrel a full year longer, the 2010 has only just been released. It is remarkable. Gorgeous classic color, with the iodine rim. Wonderful high toned floral aromatics meld with crushed berry, fennel and tobacco notes on the nose and palate. 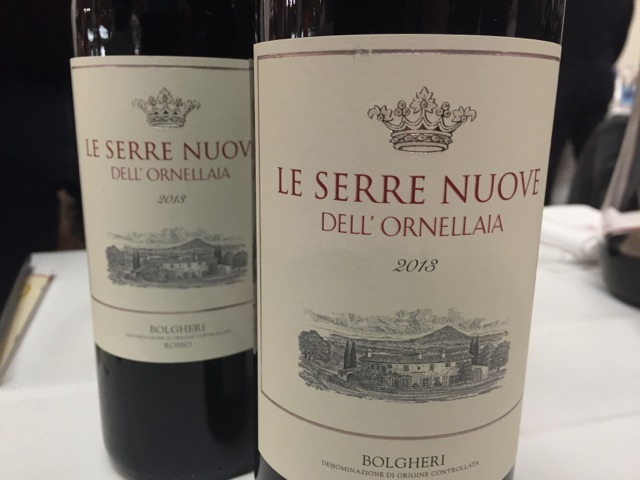 An absolutely pristine Sangiovese and a benchmark for Brunello. Unfortunately, it is ridiculously priced at around $225-$250. 97-100 points. 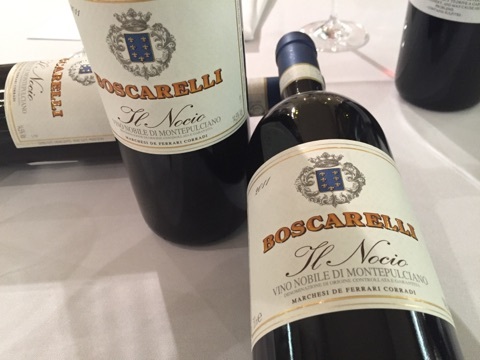 Presented by the affable owner Luca De Ferrari, Boscarelli is one of the top 3 producers in Montepulciano. Luca told me that similar to Brunello, the 2011 vintage in Montepulciano was hotter than 2010. However, he was able to manage the ripeness in his vineyards and craft this superlative single vineyard wine which gets it’s name from a huge walnut tree that dominates the vineyard. This is 100% Sangiovese and very elegant for the vintage, with complex aromas of red cherry, mushroom and cedar. It’s aged in Slavonian oak botte for almost 2 years prior to release. Flavors follow the nose with good freshness and intensity. Really delicious, but still at the top end price for Vino Nobile. 92-94 points. 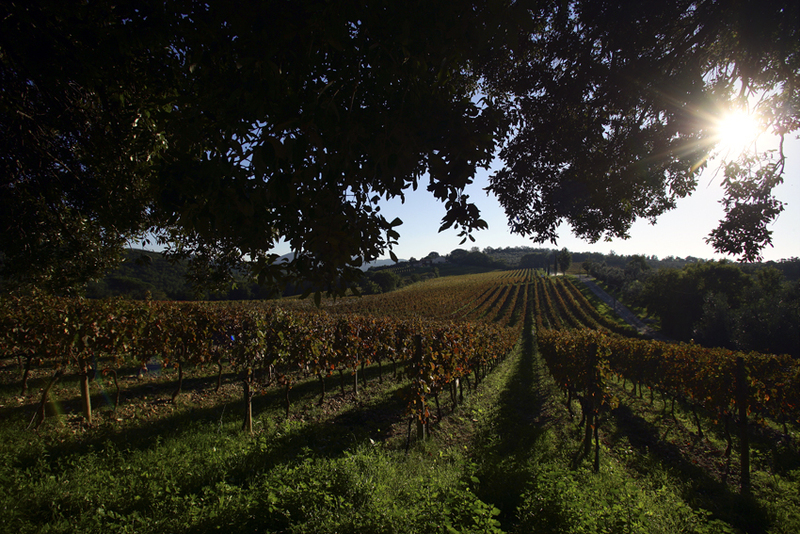 The Fuligni estate, totaling 100 hectares, is run by Maria Fuligni. The Fuligni’s source Sangiovese for their Brunello from 4 distinct vineyard parcels across the zone, each with differing exposure and altitudes that vary from 300-450 meters above sea level. Only 10 hectares are under vine. Recently, I reviewed the 2006 Brunello. Simply put, an absolutely outstanding effort. Everything you want is here – spices, fruit, woven tannins, fresh acidity, floral “lift” – loads of structure and fruit. Wonderful balance. Let the hunt begin. 96-99 points. Represented by the engaging Alessandro Lunardi, the general manager, this was another estate that I wanted to hit before the crowds began assembling. It’s really not amazing that this wine consistently garners Tre Bicchieri – what’s amazing is that it’s seemingly becoming routine. Yet I can’t quarrel with the distinction at all because the wine is stellar. 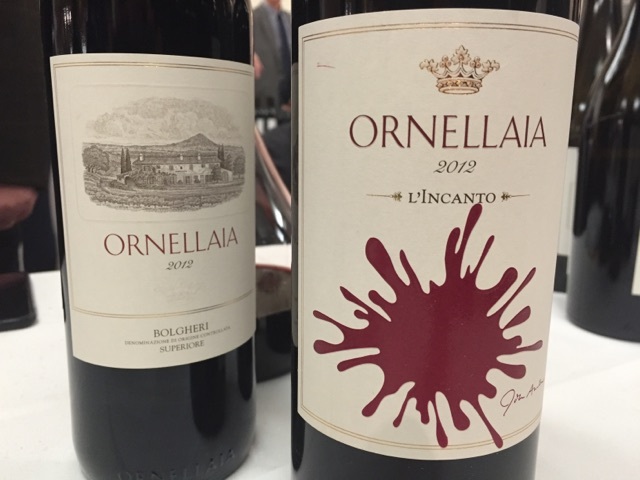 I’m putting this one first because while Ornellaia is typically excellent, this wine’s quality surprised me a little. This is the second wine of the estate but the grape sources are the same as for Ornellaia. The blend for the 2013 was 36% Cabernet, 32% Merlot, 20% Cabernet Franc, and 12% Petit Verdot. Classy and elegant, this dark plum flavored wine has plenty of tannic structure and oak, but the fruit is there in spades to back this up. Cedar, mineral and meat aromas and flavors round out this fresh wine. Aged 18 months, 6 of which are in bottle prior to release, the wine is aged in 25% new and 75% used French barrique. This was outstanding. A poor mans Ornellaia? 92-94 points. Due Bicchieri. About $55. Equally as impressive was the estate’s flagship wine. Always at least 50% Cabernet, this vintage is 56% Cabernet, 27% Merlot, 10% Cabernet Franc and 7% Petit Verdot. Muscular, with a large frame of oak, tannins, and acids – this wine is already incredibly balanced and the tannins well integrated. Aromas and flavors of black fruits, cedar, menthol, licorice and spices are dominant. The only downside is the price which is approaching $250. 94-97 points. 40 hectares of land. 24 hectares of vineyards. 1 engaging passionate man. Massimo Piccin is making great wine in Bolgheri, near Castagneto Carducci. Hand produced at every stage and as Massimo told me at length, he seeks to blend innovation with passion, and technology with tradition, all the while sustainably farming his land. 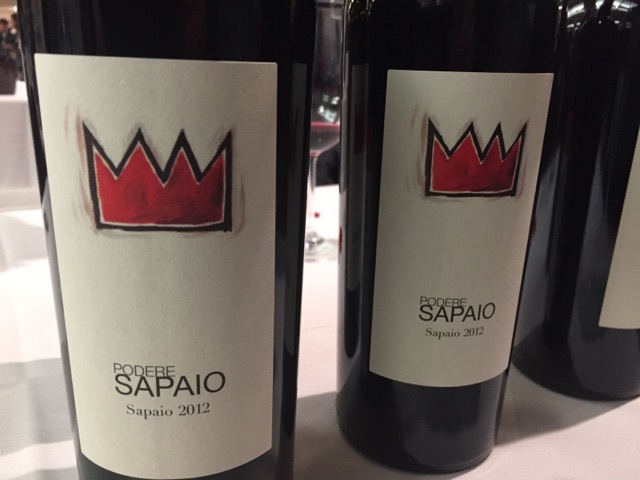 He was thrilled when I told him how the 2010 Sapaio was perfect with grilled lamb chops – “Perfetto, Giovanni” as he laughed. That’s the way to do it”. The 2012 is 70% Cabernet, 10% Cabernet Franc and 20% Petit Verdot. The wine is vinified in stainless steel tanks and then barrique aged for 18 months before a full year in bottle prior to release. Sapaio is deep purple in the glass with long viscous legs. The Petit Verdot gives this lots of heft, but the floral notes from the Franc are noticeable. Black fruit on the palate is ripe and round with balanced acidity, minerality, and cedar rounding out the profile. Definitely an estate to watch and a great value from this area of Tuscany where wines are typically over $150. 94-96 points. Price varies widely from $35-$50. Go long on the lower end. I walk up to the Petrolo table and all I see is a bottle of Galatrona sitting on the table unopened. The gentlemen at the next table was pouring Paleo and I asked him if he was also pouring for Petrolo. No, they never showed up. Just then, I stub my toe on a case of Galatrona sitting under the table going to waste. So I grabbed the nearest corkscrew, reached under the table and “Pop”…..now I’m driving the bus! I’m pouring Galatrona by the glassfull for everyone, including me. 2 or 3 glasses later…..
How you arrange for a tasting like this and fail to show up is beyond me. It’s just a damn shame I couldn’t boot the remaining 6 bottles, because I know they were just going to get thrown away. Galatrona is amazing. It’s among my favorites and although it’s expensive, it’s a value compared to wines like Redigaffi, Masseto, and L’Apparita. Blackish purple. Black fruit, licorice, cedar and mint on the nose and palate. Just velvety with a touch of bitter chocolate on the finish. Stunning as always. 95-98 points. About $90. 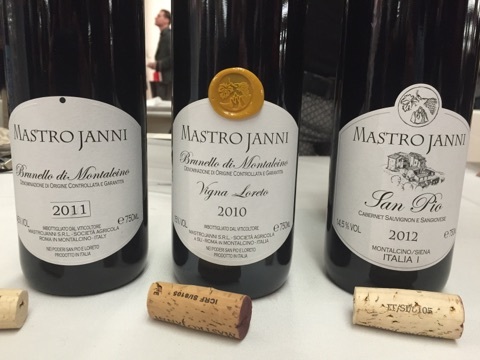 Talk about an estate on a roll – Mastrojanni is rolling down hill. The lovely Rada Linke was on hand again to pour the wines. Three different vintages, three very different wines. It doesn’t get any better than this. This is a single vineyard Brunello that struts all the stuff that 2010 has to offer. It’s all there. Flowers, spices, herbs, tobacco, and loads of cherry fruit that is just mouth watering. Integrated tannins and perfect balance round this out. My my my. 98-100 points. About $75. San Pio is 70% Cabernet and 30% Sangiovese. Lots of structure to this deep purple wine. Large core of fruit with massive young tannins in this not yet released wine. More power than elegance with black fruits and spices and right now, not much more. Really has the stuffing to age and is an excellent value. 90-93 about $35-$40. Due Bicchieri. 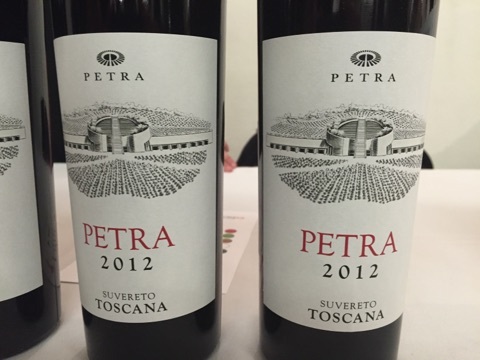 Sporting a new classy label – much better than the old one – Petra’s Rosso from Suvereto was impressive. Dominated by Cabernet, the 2012 is a massive wine with perfectly ripened flavors of blackberry, anise, vanilla, and fresh leather. Broad shouldered, with lots of tannins and acids to provide structure. The balance is there, but this needs some cellaring to soften the tannins. Those who have patience with this will be richly rewarded. 93-96 points. Represented by the gentlemanly Andrea Cecchi and the fine folks at Terlato, this lineup of wines never fails to impress, showcasing two wonderful Tre Bicchieri wines. Medium ruby, bright and forward. A mid-weight textbook Chianti Classico from Castellina in Chianti that is everything you’d want from the type. Floral tones, berries, dried herbs on both the nose and palate lead to a refreshing finish. Great value. 89-91 points. Due Bicchieri. I’ve written about the amazing 2010 version of this wine and the 2012 is no less impressive. This is one of the best values in Chianti Classico Riserva. Period. Loaded with bright red berry fruit, this has fresh sage and tobacco on the nose and palate and a mouthwatering refreshing sensation that compels another sip. Balanced and full bodied, this will evolve so well over a decade. 92-95 points. I was able to review this before it had even been released to the market. It was stunning then; I think it’s pretty much in the same place so I’ll stand by my earlier review: No Compromises. The 2011 is a blend of 50% Sangiovese, 20% Petit Verdot, 20% Merlot and 10% Cabernet. 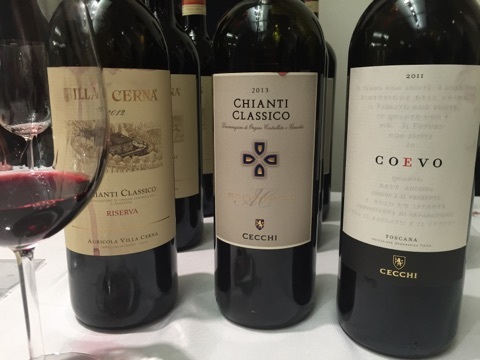 The former and latter varieties come from Cecchi’s estate in Castellina and the middle varieties from their estate in Maremma. I tweeted during the event that Piaggia just may be the best kept secret at Gambero Rosso. This is somewhat of a surprise to me since they’ve had wines at the event for the last 4 years and even more impressive that it’s often a different wine. Yet proprietor Silvia Vannucci was alone each time I went past her table. If you’ve been a reader of Tuscan Vines you know I think “Il Sasso” is among the best values in all of Tuscany. I routinely rate it at 90+ points and it’s about $20-$25. I recently purchased the wine for $18 and reviewed it completely in October of 2015. My review is on point. Go long. Due Bicchieri. My oh my! This is special stuff. Deep ruby, to almost purple in the glass with a faint fade at the rim. Aromas of flowers, berries and plums, coffee, lavender, mint – this is so expressive and polished. Flavors mimic the nose and are long and elegant. Juicy, ripe acidity keeps it all fresh. Emiliano Falsini is a genius! Another great value around $30-$35. 70% Sangiovese, 20% Cabernet, 10% Merlot. 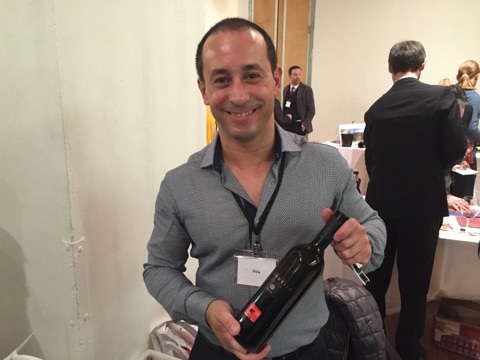 Winemaker Fabio Angius was on hand to pour his lovely wines. I remember a few years back, he expressed some frustration that his wines were falling short of Tre Bicchieri. That was relieved 3 years ago and now he’s a fixture at the event. Pala is a name you should know. They’re the best winery on Sardinia. Extra Tip: While 2014 was a total washout of a vintage “In Italy” – Fabio shared with me that for Sardinia, it was one of the best vintages in modern times. Take advantage! This is 100% Vermentino and one of the best and freshest white wines I’ve had in a long time. Medium gold color with lots of citrus, mineral, peach and lemon aromas and flavors. Viscous body, medium to full but with wonderful acidity that gives the entire wine lift. Tre Bicchieri and then some. 91-93 points. This wine has been Tre Bicchieri in the past and I find it hard to believe it’s only Due Bicchieri this time. Blackish color with aromas of black plums, grilling meat, earth and herbs. Unripe Cannonau can seem funky – this is not. Long on the palate with excellent balance, this wine screams for roasted lamb. I love it. 93-96 points. 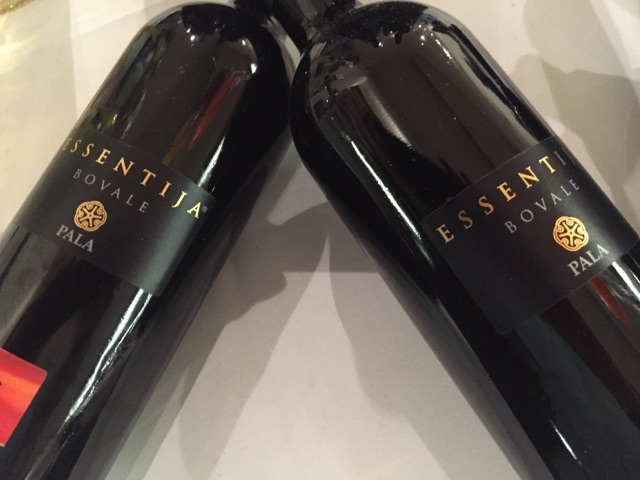 100% Bovale, and indigenous grape to Sardinia. It’s unique, so I can’t really compare it anything else. So order it at your shop and taste it! You won’t be disappointed. Deep reddish black color with wild plum aromas and flavors that are accented by smoke, pipe tobacco, leather and anise. Long and balanced, this is very tannic but balanced well with loads of fruit that they are not intrusive. 92-95 points. Due Bicchieri. 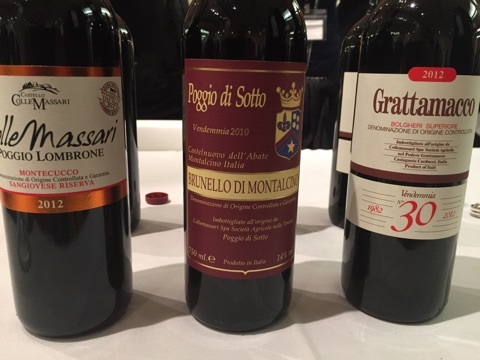 This tasting reinforced what we’ve been hearing for a long time and that is that Italian wines, from throughout Italy, have never been of higher quality. Even just in the last 4 years covering this event, I’ve seen wines produced from all corners and all grapes of the country that can easily stand proudly on the international stage. That is great for me and consumers alike. Furthermore, with Italy now the largest producer of wine in the world, finding many of these wines is no easier than its been. Salute! Stay tuned for more!